Roadway and sidewalk improvements were made to Wolf Street and Caribou Street in the spring of 2018. Work took place between Banff Avenue and Bear Street on both Wolf and Caribou. This is part of a three year trial to determine the future, permanent street design of Caribou Street and Wolf Street. 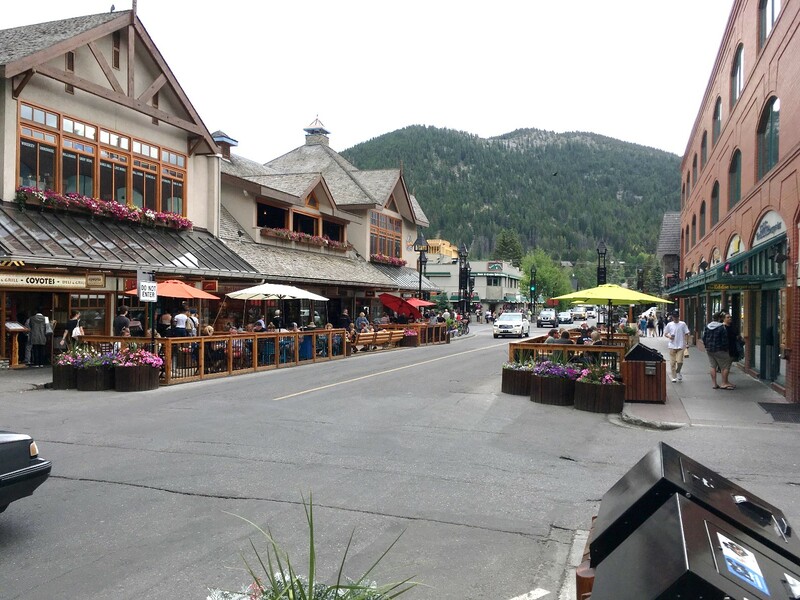 Although it looks similar to the Bear Street Woonerff, the trial for Caribou Street and Wolf Street will more closely follow the Banff Refreshing design and the urban design principles from Banff’s Downtown Enhancement Conceptual Plan. The Bear Street Woonerff was one of the recommendations from the 2013 Transportation Master Plan. Following the success of the first season of the Woonerff trial, the Town of Banff surveyed businesses along Wolf Street and Caribou Street to measure interest in making sidewalk improvements between Banff Avenue and Bear Street. The majority of respondents were in favour of the project. Improvements include bike parking, landscaping, public seating and seating areas specific to commercial users with a Sidewalk Seating Permit. The design is intended to attract pedestrians to the area and to improve pedestrian connectivity between Banff Avenue and Bear Street. The entrance and exit to the alley has been designed by consulting engineers. There is a ‘No Left Turn’ for large vehicles from the north laneway on Caribou Street. Drive lanes are maintained at 3.5m (wider than Bear Street/Banff Avenue). One loading stall and one parking stall will be been maintained on Caribou Street. Three parking stalls have been maintained on Wolf Street. Painted crosswalks were installed for mid-block pedestrian crossing. All sidewalk seating on Wolf and Caribou Street is non-abutting to business frontage, meaning the concrete sidewalk in front of businesses remains clear for pedestrian movement and restaurant seating must be located on wooden platforms. The length of the restaurant seating areas is determined by width of business frontage at grade and other physical realities including road alignment, existing street furniture and vehicle drive aisles as recommended by civil engineering consultants. For more information on street design, contact the Engineering Department at 403.762.1277. For information on sidewalk seating, contact the Planning and Development Department at 403.762.1215.